This is the 8/11/17 re-write of two previous monologues on entropy and significance. There is another article here which I may rewrite also. Thinking about the connection between self-organization and decreasing entropy – which I’ve considered many times before, today gave me an insight which connects self-organization and sense, which I hope could contribute to a mathematical appreciation of sense. It goes like this: If you can discern increased entropy from decreased entropy, then there is a greater probability that eventually that discerning capacity will inspire some effect resulting in decreased entropy. Compared with a system in which absolutely no sensitivity is possible*, one which includes sensing and sense-making at least has a non-zero potential for discovery of significance. Significance in this context refers to a power to care about sensed conditions in a way which projects a saturation of sense qualities upon them, highlighting them and bringing them into a foregrounded quality of ‘focus’ and ‘attention’. Consciousness can become ‘fixed’ on the sensory presentations, learn more about them, and perhaps modify them intentionally. That last bit would only be true, however, if said sensing and sense-focusing powers also had a access to a ‘motive effect’. The motive effect for us is called ‘will’. The power not just to pray that something gets you out of bed in the morning, but to activate millions of cells all over your body at once and lift your brain-body into a standing position on the floor. Without that effective bridge between ‘mind’, brain, body, and the tangible world of bodies and objects presented by tactile and visible sense, there is nothing we could do with even infinite knowledge. No matter what you could know about your own nervous system, or how determined you feel about moving your body, you could still be paralyzed and helpless to do anything about it. If we wanted to apply an anthropic principle to ‘sense’, we could say that only the universe in which sense and motive happen to exist and relate to each other in a significant, motivating, and effective way** will allow the possibility of any sustained decrease in entropy appear. Without that statistical probability shaking out to at least one physical success, every universe would maximize its entropy instantaneously (if we assume that a universe without sense could even exist, which I do not). There would be no sense experience to slow down any interval between any state of entropy to the highest entropy state. The time between big bang (with its unexplained supply of low entropy) and heat death would be not be experienced as a duration relative to another experience, so there is no reason to expect that there would be any real duration at all. If there were a bazillion senseless universes before this one, it literally would not matter. They would end as soon as they began because physics has no preferred frame of perception – no normal timescale to make a billion years seem like a ‘long’ time. Only when sensory-motive experience appears could a universe seem to last longer than an instant (and without sense there wouldn’t even be an instant). What I’m trying to say is that a sensory-motive-motor capacity is the minimum possible ingredient for any realizable universe – not just because intuitively the idea of an unsensed universe cannot withstand serious inspection, but also because sense is the only capacity which can tilt the odds of instantaneous heat death to something other than 100%. Sense confers the power not only to drive negentropy but to step out of entropy-negentropy and into intention. Intention gives us the power to choose to create significance or entropy. We can extend our intention teleologically, and execute long term plans which involve many different modifications of the second law of thermodynamics. We can destroy in order to create, or vice versa. Sensory-motive-motor phenomena should be recognized as the meta-negentropic force of nature. It not only builds what entropy tears down, it builds more builders, and builds them faster and faster. It takes gravity – the meta-entropic meta-phenomenon to crush that significance and prevent the universe from achieving the antithesis of heat death too quickly. Now that we have established a physical function for the trans-physical phenomena of sense and significance, we can get closer to quantifying the dynamics. It seems reasonable to expect that the more sensitive a system is to the difference between increases and decreases in entropy, the more its efforts will end up decreasing entropy eventually. Even if some sensitivities lead to a pathological pursuit of greater entropy, an entity which selectively destroys order is still more orderly on balance than a non-entity, since its very selectivity leaves an unintentional trail of coherence. Creators can learn from destroyers and no destruction can completely prevent that. The universe includes the potential for things like archaeology and self-reproducing seeds. Universes with no sense contain no resistance to instantaneous heat death. Universes with impotent sense (sense affects without motive-motor effects) dilute the instantaneousness of heat death, but cannot act to reverse it. Universes with sense but no significance (effects which are not motivated by affects are literally insignificant; they can’t change the rate of entropy increase above chance). Universes with minimally sensible sense (affect overlaps effect, but only under rare conditions). Universes where strong sensory-motivation (nested consciousness) is possible. It seems like there is a criticality between 3 and 4 where anything below 3 would lead to instant heat death and anything above would lead to 5 eventually. *A system without sensitivity is a machine. It has motor effects but no motivation affects and no necessity for any transfer from feeling of motivation to a physical effort. The machine needs no motive, it is only a sequence of structured actions and their consequences. **i.e., a universe in which sense and significance are married to intention and physical power through ‘care’. This rather insane looking diagram was an attempt to depict a metabolic cycle of public and private physics. The private phenomena are presented as intangible – literally ‘things’ which cannot be physically touched; feelings, thoughts, sensations, selfhood, etc. I am saying that this is the actual context in which ‘here’ and ‘now’ exist. The private side is the creator, appreciator and destroyer of entropy and significance. The public side is the preserver of entropy and insignificance. It is the context of worlds, bodies, and objects which are nested literally in tangible and visible size. Particles, forms with positions in space. As the private context receives public experience, it also decomposes into it. The receiver of experience serves as the divider, the Maxwell’s Demon which partitions what would otherwise be an eternal moment of block time into linear sequences of experience as well as loopy sequences of experiences fused with memories of other experiences. The memories too tend to have a metabolic path of their own, morphing and mutating to enhance the significance or insignificance of the current moment. 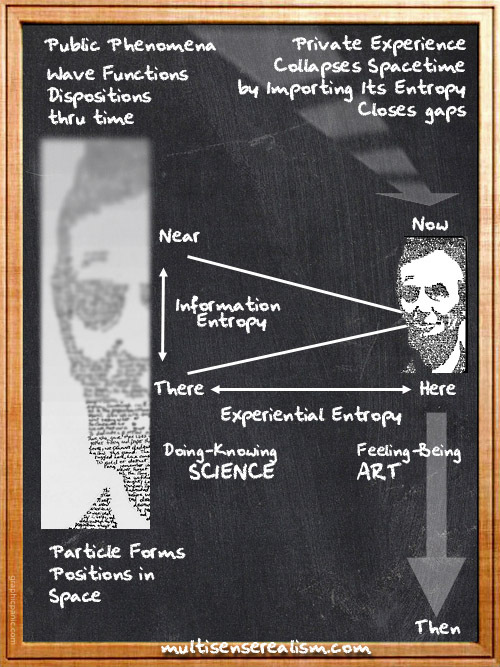 In the top right hand corner of the Lincoln diagram is the cryptic and unnecessarily capitalized label “Private Experience Collapses Spacetime by Importing its Entropy”. What I mean by ‘its’ here is Public facing experience. The tangible world is running on entropy. Our job as Private entities is to use our ability to summarize and symbolize to extract the insignificance out of nature and transform it into…what? Art. Myth. Supernatural content. Fiction. History. We are editing out the repetition of physics and of information processing and concentrating what remains into a surreality of hyper-saturated meta-experiential experiences. We can generalize an entire period of history with a single gesture or image. A poem or song can bring together elements from an entire lifetime of experience which resonates with all lifetimes of experience. A scientific idea does the same kind of operation, but it focuses on extracting the timeless principles of the public or tangible end of our sense presentations. Often, when peripheral vision is being explained, an image like the one on the right is used to show how only a small area around our focal point can be sharply seen. The periphery is shown to be blurry. While this gets the point across, I think that it also obscures the subtle features of perception. If I focus on some part of the image on the left, while it is true that my visual experience of the other quadrants is diminished, it is not diminished by becoming indistinct or blurry. Somehow the look of distinction is maintained and not degraded visually while the distinctions themselves become less available cognitively. At all times I can clearly tell the difference between the quality of the left image and the right image. If I focus on a part of the right hand image, the unfocused portion does not blur further into a uniform grey, but retains the suggestion of separate fuzzy units. If peripheral vision were truly a blur, I would also expect that when focusing on the left hand image, the sharp boxes in my peripheral vision would look more like the fuzzy blobs on the right, but they don’t. No matter how I squint or unfocus or push both images far into the periphery of my sight, I can easily tell that the two images are quite different. I can’t resolve detail cognitively, but I can always see that there is detail available to be resolve. If I look directly at any part of the blurry image on the right I can easily count the fuzzy blobs when I look at them, even through they are blurred. By contrast, with the image on the left, I can’t count the number of blocks or dots that are there even though I can see that they are block-like. Peripheral vision is an attenuation of optical acuity, but not in a way which diminishes the richness of the visual definition. There is uncertainty/entropy, but only in a top-down way. I still have a clear picture of the image as a whole, but the parts which I’m not looking at directly are seen as in a dream – distinct but generic, and psychologically slippery or intangible. What I think this shows that there are two different types of information-related entropy and two different categories of physics – one public and quantitative and mechanical, and one private and qualitative or aesthetic. Peripheral vision is not a lossy compression in any aesthetic sense. If perception were really driven by bottom up processing exclusively, we should be able to reproduce the look of peripheral vision in a graphic image, but we can’t. The best we can do is present this focused-in-the-center, blurry-everywhere-else kind of image which suggests peripheral vision figuratively, but the aesthetic quality of the peripheral experience cannot be represented literally. I suggest that the capacity to see is more than a detection of optical information, and neither is it is a projection of a subjective simulation (otherwise we would be able to produce the experience literally in an image). Seeing is a visual quality of attention, not a set of processed data. It is not only a mechanism to acquire functional data, it is more importantly an aesthetic experience.